the Windows Embedded Standard team has announced the certification exam for Windows Embedded Standard developers. There is already a certification exam for Windows CE developers(http://msdn.microsoft.com/en-us/embedded/cc294468.aspx) so this is the next logical step. MSFT is looking for experts in device development to influence the scope and direction of this exam to make sure it is not a certification you might as well draw from a box of Kellogs Cornflakes. Having trouble finding Windows Embedded CE 6.0 info in MSDN? Well here is something Olivier posted in his Blog which will make life easier for you. The guys from the .NET Micro Framework Team have just made the Beta for the V3.0 SDK available through the Microsoft Connect Website: http://connect.microsoft.com/netmf. They are also giving away a RicaVision VAVE100 universal remote control (running SideShow and .NET Micro Framework) as part of the beta! So be sure to check it out! And if you would like to see the new features, check out Jan Kučera's site. The .NET MF SDK V3.0 is planned to ship later this calendar year. MS is hosting a live chat tomorrow, July 29th, regarding Windows Embedded CE and Windows Mobile. You may think there is not alot to investigate on a simple WaitForSingleObject (W4SO) call. Millions of lines of code with this API lead us to a test coverage of 100 percent. But out of the blue it happens: W4SO doesn't do what is expected. And it's easy to prove. If you read the description of KB953311 you may wonder what strange things a programmer must do to get into this trouble. If you read again carefully you will find out. But your event will (nearly) never be signaled, e. g. it's the power button or an overcurrent interrupt. You may wait an INFINITE timeout and everything is fine. Or you set up a timeout and check the return value of W4SO. Then you meet the first condition for this problem. The second condition is very easy to achieve: Your system is simply at it's limits. The online help says W4SO returns WAIT_OBJECT_0 or WAIT_TIMEOUT and you believe it. But sometimes it returns WAIT_FAILED which means invalid handle. After hours of perfect working your handle is now invalid? How long do you think you will need to find this bug? Let's have a look at the interrupt processing. If you call InterruptInitialize your event will be a special event which is handled in a different way. The scheduler must consider the change of the event's state after each interrupt. You have to wait with W4SO on an interrupt event, you cannot use WaitForMultipleObjects instead. A thread with higher priority than our interrupt service thread blocks the system for more then your W4SO timeout time. This circumstances may lead your W4SO to return WAIT_FAILED and never come back to normal WAIT_TIMEOUT operation. But if you trigger the interrupt your interrupt service thread returns back to life. Microsoft was able to fix the problem with 6 lines of code. With shared source installed we are very lucky to have the opportunity to look into the file schedule.c (WinCE500/Private/Winceos/Coreos/Nk/Kernel). You may try to understand how the scheduler works. To be honest, it isn't trivial. But you may use a driver and a stress test program to see the problem. And what do we learn: There is never 100 percent test coverage, even in such a central OS component like the scheduler. So you've had a hard time finding a book on Windows Embedded CE, have you? In that case I've got good news for you! In addition to Doug Bolings book Programming Windows® Embedded CE 6.0 Developer Reference, which focuses on application development, Microsoft Press has just released Windows Embedded CE 6.0 Fundamentals by Stanislav Pavlov and Pavel Belevsky. In contrast to Doug's book, Windows Embedded CE 6.0 focuses more on BSP development. And if that isn't enough WROX Press are planning to bring out a book in autumn: Professional Microsoft Windows Embedded CE 6.0 by Samuel Phung. development, fast time-to-market, manageable development risk and cost are key factors contributing to the success of any project. With its long successful track record as the leading software development tool of choice for many developers, Visual Studio has a huge existing user base and growing. By using the Visual Studio 2008 development environment, programmers can accomplish development tasks for Windows CE 6.0 projects rapidly. Existing Visual Studio developers can leverage the skills they already have and adapt them to develop applications for Windows Embedded CE in a short amount of time. Windows Embedded CE provides one of the best embedded development environments from the overall cost, risk, and time-to-market perspectives. As key companies adapt and use Windows Embedded CE as their choice of platform for product development, the need for developers with Windows Embedded CE knowledge will rapidly increase. The primary objective for this book is to provide how-to information with working examples so developers can learn the overall Windows Embedded CE development environment quickly and effectively. This book will show how different pieces of Windows Embedded CE components come together to help programmers develop and build devices. Sometimes you have one BSP that has to support slightly different hardware due to adaptions for end customers. Usually, there is a globlal compiler define which is set in sources.cmn (or somewhere in sources files) and if you later add a new variant, you have to go through all those files and add the support for the new variant. A really simple solution which only requires re-linking of executables followed by makeimg is to build variants of a library where each variant follows a defined naming scheme. And even better, for a new variant you just add the catalog feature, add the sources/makefile for the component variant and that's it. The kernel has to link either the optimized or the conservative variant of the pci library. And therefore the catalog file offers the features "PCI optimized" and "PCI conservative". The features either set the environment variable PCI_CTRL_CONSERVATIVE (or don't). As you can see, the file name of the library variants has an extension which is used by sources.cmn. The other advantage of this mechanism is that there's not need to re-compile the whole project. Just link and run makeimg. That's all. And don't forget to sign up for the .NET Micro Framework newsletter. Sign up here. To ease issue tracking in my recent projects we added resource information (short description, build number/date and a small icon) to all dlls and executables provided by us. Unfortunately, we got an exception in GWES when the shell started up and I myself spent quite a lot time to trace down the root of the problem. The exception occurred in the coredll function FindTypeByName (). A closer look at the function parameters and the call stack (unfortunately, most of the functions are private-private code) indicated, that there is a misinterpretation of a resource item. How to reanimate a bricked iMXS Micro Framework reference board..
..or simply how to use JTAG. In Visual Studio it’s only one click to deploy your application to the USB connected Micro Framework board. But at some point this might not work for whatever reason. Maybe you tried to update the booter or TinyCLR using FlashLiteClient or MFDeploy and something went wrong during flashing. These deployment tools need some kind of software running on the target board to talk to. But what if this software gets corrupted? How can we re-establish the factory state of the board? Fortunately the latest iMXS Development Kit contains beside the two available booters the original binary image of the shipped sideshow application. There is also a document with the flashing instructions included: “Software Used: ARM Developer Suite V1.2, Hardware Used: ARM Multi-ICE debug unit.” This doesn't sound very cheap. And in fact you have to spend several thousand dollars to get this. But do we really need this equipment just for flashing? If you look around you will find some really low-priced JTAG adapters, which can be used to access the hardware as well. 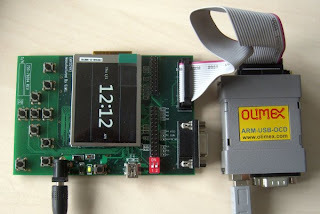 In the following we’ll use the USB JTAG debugger “ARM-USB-OCD” from Olimex (about 70$) and the software OpenOCD (it’s free like free beer). No, that’s not an error message! Everything went well when this command window appears. There is no nice GUI and you can not even type in anything. How does it work? 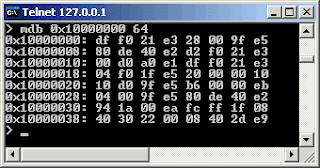 OpenOCD runs as a server, waiting for connections from clients like telnet or GDB. In the configuration file we specified the telnet port as 4444.
voilá, only ffffffffffffffffff... The flash is erased. To write the data, we use the command "flash write_binary bank file offset"
Team Trail Blazers from Singapore! Congratulations! More about the winning Teams and the runners up of the Imagine Cup 2008 and how to participate in the Imagine Cup 2009 in Egypt can be found at http://imaginecup.com. If you’re looking for the reason of a data abort or an exception which occurs during application execution on CE 5.0 or 6.0. Then take a deep look into Bruce Eitman’s following blog entries (http://geekswithblogs.net/BruceEitman/archive/2008/05/19/windows-ce--finding-the-cause-of-a-data-abort.aspx and http://geekswithblogs.net/BruceEitman/archive/2008/06/02/platform-builder-find-the-source-of-a-data-abort-an.aspx). They provide a very simple explanation about usage of MAP and COD files for crash investigation on Windows CE based systems. Creation of MAP files with Platform Builder depends on the value of the WINCEMAP macro in your SOURCES files. With IDE you should set the “\Fm” linker option. For creation of COD files with PB set the environment variable WINCECOD to 1 and rebuild. When using IDE (e.g. Visual Studio) you should add the compiler option “\FAcs” or set the correct entry in the IDE (C/C++ --> Listing file type --> Assembly, Machine Code, and Source). For the Monte Carlo Profiler, you need to implement a Timer Interrupt Handler. WinCE600 calls the OEMXxx functions in a different way than WinCE500. This might be the cause of a problem when porting the profiler from WinCE500 to WinCE600. PUBLIC\COMMON\OAK\INC\oemglobal.h. By default, the function addresses of the non optional components will be saved automatically. But optional components like OEMProfileTimerEnable() are not included in the OEMGlobal structure, so the Kernel can't call this function. check out the .Net Micro Framework Team Blog for news on what the guys are working on for .NET MF 3.0. Great stuff! Keep on the good work lads - which reminds me I still owe them a pint! A couple of weeks ago I was - at last - able to show off one of the smart watches we had been working on; running .NET Micro Framework. "Well, that's nothing new! ", you might say. But, how about having map data on that watch and being able to zoom in and out and move around on that map - and all of that with good graphics and good performance! Picture this: After arriving here in Erlangen you download a map of Erlangen into your watch and that directs you directly to the "Bergkirchweih" - Assuming you visit Erlangen between May 28 and June 8, 2009. So to answer my question: I'm absolutely sure we will see more .NET Micro Framework in the future. If your device has a USB host controller with both EHCI (USB 2.0 host controller) and OHCI (USB 1.1 host controller) components (e.g. NEC 720101), communication always starts with EHCI and is handed over to OHCI if an OHCI device is detected. Since the standard EHCI and the OHCI drivers both have the same load order in the registry, either one of them can load first. Both, EHCI and OHCI drivers have their own HubStatusChangeThread, which is responsible for detecting insertion and removal of USB devices. Normally, every attach (or detach) is handled by the EHCI driver. If the EHCI driver detects that the attached device is an OHCI device it hands it over to the OHCI driver to handle the attach. A problem occurs when the OHCI driver loads before the EHCI driver. In that case the OHCI HubStatusChangeThread will also start first. If a device is attached to the USB host controller port before the EHCI HubStatusChangeThread is loaded, the OHCI driver will handle the attach. This behavior results in a slower boot time of the device or even a crash or freeze of the device while booting depending on whether the EHCI HubStatusChangeThread is loaded during the OHCI attach or after. Don't forget to register on/before 31 July 2008 to qualify for the Super Early Bird Offer! The following updates for Windows CE have been recently released and are available for download. More information for each update is provided in the Readme document available after the individual update(s) has been installed. Description: This is a set of updates for Windows CE Platform Builder released during the period of June 1 – June 30, 2008. These Microsoft Windows CE updates are fixes for Windows CE operating system problems you run into during the development and maintenance of your custom platform. Ihre Fragen können Sie natürlich gerne auch in Deutsch an uns schicken. Avnet Embedded is Europe's leading Microsoft Windows Embedded distributor. Avnet Embedded can place a team of very well trained engineers at your disposal. Avnet Embedded's task is to determine the best Microsoft Windows Embedded operating system for your application. Thus, with a broad product range, extensive service and high professional competence, Avnet Embedded can help you get your developments more quickly to market. I've been boasting this BLOG quite a lot in the past and now here it is - at last! The team hopes you will find lots of interesting information around Windows Embedded.